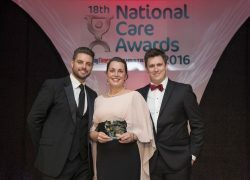 The 18th National Care Awards were celebrated with a wonderful gala evening at the London Hilton Metropole on Friday 25th November. Ex-Boyzone member and Coronation Street star, Keith Duffy hosted the event sponsored by business across the care sector. For the Fourth consecutive year, Compass Associates sponsored the Care Operations Manager Award category. 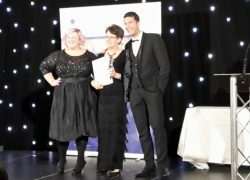 We were delighted that the award was presented to Ruth French of Stowlangtoft Healthcare. Congratulations to Ruth and all the other award winders and nominees. Compass Associates also sponsored the photobooth for the evening which, as always, was a great opportunity for guests to capture their memories of the evening. On Tuesday 22nd and Wednesday 23rd November Becky Branson, Sophie Taylor and Den Muharrem of our Surgical Hospitals team exhibited at the AGM & Patient First exhibition at the ExCel Centre, London. Patient First is the UK’s largest patient safety event and supports those working within the NHS and independent healthcare sectors. The event also serves as an opportunity for healthcare professionals to complete CPD and network with their peers. Louis Pace, Senior Recruitment Consultant and Lily Parke, Marketing Associate attended the Scottish Care National Conference & Exhibition for the second year in a row, exhibiting in the main conference room. The conference serves to promote everything positive within the care home industry with this years theme being “Care Homes at the Heart”. 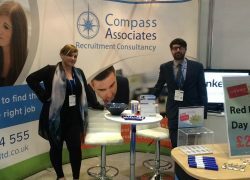 Following the Conference & Exhibition, Louis and Lily were joined by Kate Fairbrother, Director of HR & Communications for Compass Associates and Luke Osborne and Ben Westcott, Senior Associates for Compass Executives for the Scottish Care Awards. This year, Compass Associates were proud to sponsor the Significant Contribution Award category.